A beautifully presented two bedroom Victorian cottage situated within the conservation area of Tring. The property has been tastefully decorated by intertwining character features with modern touches. Offering convenient access to the town centre, this property is offered to the market comprising; Lounge, Kitchen, family room/dining room, two bedrooms, and rear garden. Double glazed window to the front, brick fireplace with inset multi fuel burner with slate hearth, radiator, opening to the kitchen. Double glazed window to the rear, understairs storage cupboard, television point, radiator. 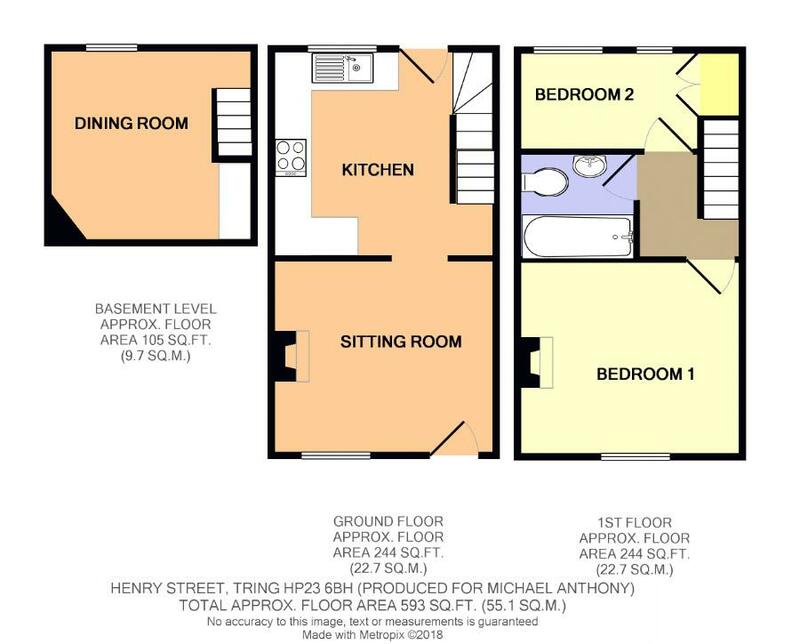 Fitted with a range of units at base and eye level, double glazed window to the rear aspect, space for fridge/freezer, washing machine and cooker with extractor over, part tiled walls, wall mounted gas boiler, door to garden, stairs rise to the first floor, stairs to basement. Doors to all rooms, access to part boarded loft space with light. Double glazed window to the front aspect, feature fireplace, radiator. Two double glazed windows to the rear aspect, built in cupboard, radiator. Three piece suite comprising low level wc, pedestal wash hand basin with mixer tap, panelled bath with shower over, part tiled walls, heated towel rail. Block paved patio area with steps leading to decked area, lawn area with shed storage, enclosed by trellising and fencing, mature shrub borders, gated access, external water tap.